The city of Tallahassee, Fla., produces Class A biosolids at its T.P. Smith Wastewater Treatment Plant. The city formerly land-applied Class B biosolids that resulted from treating their wastewater sludge. Site limitations, federal regulations, and cost considerations prompted the water utility department to upgrade its operations to Class A status. "For years, we simply dewatered our sludge and applied the resulting Class B biosolids to city-owned land at the city airport, as well as to farmland in a nearby county," said Jim Oskowis, water utility general manager. "But these options disappeared overnight." A study initiated by airport officials indicated that birds, possibly attracted to the land application activities, might become a potential hazard to aircraft during takeoff and landing. Also, heightened security concerns in and around the airport area hindered the water utility's land-application trucks from moving freely across airport property. "The situation didn't throw us into a complete panic," Oskowis said. "We knew that we still had sites to land-apply our Class B biosolids in nearby Wakulla County. However, we did get real serious about looking for alternatives to our current land-application plans. "We knew we eventually wanted to go to Class A (known as "Class AA" in Florida) with our biosolids, following Clean Water Act 503, Part 40 regulations." By upgrading to Class A, the city could sell the plant's residual biosolids as a beneficial fertilizer and soil conditioner to the agricultural market, commercial nurseries, and other businesses. "From long-term economical and environmental standpoints, it makes good sense to move to Class A material," said Water Utility Engineering Manager Lynne Putnam. "Other municipalities, such as Milwaukee, Wis., have been producing and marketing similar products for years." The final straw came when the city's routine and periodically renewable permit for the land application of Class B biosolids in Wakulla County suddenly faced public opposition. Although the opposition was limited, the county commission voted against the permit and sent the city a "cease and desist" letter. Water utility personnel knew they had to move fast, so they began exploring various technologies for producing Class A biosolids. Technologies that meet Class A standards include thermal treatment methods such as composting, heat drying, heat treatment, thermophillic (heat-generating) aerobic digestion, and pasteurization. The technologies must process the biosolids for a specific time at a certain temperature. Personnel decided on the indirect heat drying technology, which applies indirect heat to the biosolids to reduce moisture content. Heat drying eliminates pathogens, reduces volume, and produces a greater than 90-percent dry product that meets 503 Regulations. The process also creates Class A biosolids that can be used as a beneficial organic fertilizer or soil amendment. After developing specifications and proceeding with the bidding process, the water utility chose an indirect rotating chamber biosolids dryer from USFilter Davco Products called the Dragon Dryer® system. Installed in March 2004, Tallahassee's system is designed to dry about 90 percent of the city's daily sludge production. With an operating capacity of 50 wet tons of biosolids per calendar day at 15 percent dry solids, the drying system reduced the wastewater treatment plant's outgoing sludge volume ratio by 75 percent. Data from July 2004 indicates that operational costs, natural gas, and electricity average $18 per wet ton. Comparatively, the city's Class B disposal program sometimes costs more than $28 per wet ton at 14-percent to 17-percent solids. The drying process saves Tallahassee at least $10 per wet ton and, more importantly, has reduced liability associated with its former Class B disposal program. "We have a solution that doesn't depend on the availability of land application sites -- or the weather -- and we are literally able to sell our Class A biosolids," Oskowis said. "This is a far better situation than we were in this time last year." Aware of the high demand for Class A biosolids, USFilter worked with the city to help arrange for the sale of the dried material as a beneficial reuse material. "This helps eliminate the uncertainty associated with developing a new customer base for the biosolids," says Putnam. "The production and sale of the dried Class A biosolids helps offset our operational costs. But more importantly, the process produces a safer byproduct that removes the liability and costs associated with disposing of Class B biosolids." The water utility currently sells its Class A biosolids for $10 a dry ton, which does not cover the entire operational costs of the dryer. The dryer produces Class A biosolids in granular form, which is preferred for direct land application. The smallest particles dissolve and absorb almost immediately into the soil while the larger particles dissolve over several months. The water utility is considering possibly providing sludge-drying as a service to smaller cities in the area. To support this need, and to ensure it has enough drying capacity even during routine maintenance, Tallahassee will add a second sludge-dryer in the near future. During operation, a variable speed transfer screw auger introduces mechanically de-watered sludge cake into the system from a feed hopper. Three gas burners heat the dehydration chamber in three regressive temperature zones, while a fourth burner heats the oil in the thermal hot-oil unit. The hot oil flows through a code-stamped, hollow-flight auger that moves the dewatered sludge through the dehydration chamber and provides additional indirect heat. The indirect heat keeps the sludge from coming in contact with the heat source. This prevents the sludge from overheating to the combustion point and ensures that no harmful emissions are released. The hollow-flight auger and the dehydration chamber rotate in opposite directions, agitating and turning the biosolids to achieve maximum contact between the material and the system's heated surfaces. Once the dried biosolids pass through the dehydration chamber, they are discharged as a Class A product onto a conveyor for transfer to a storage facility. The system also offers simple and effective odor control. 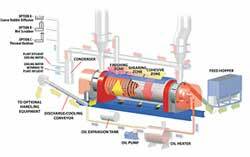 Gases from the dryer's negative-pressure dehydration chamber are passed through the dryer's condenser. Here, a blower sends them to air diffusers in the treatment plant's aeration basin where they are diffused under water, resulting in essentially zero emissions. This editorial originally appeared in the September 2005 issue of Environmental Protection, Vol. 16, No. 7. Tina Roesler, MSPT, ABDA is the director of training and education for The ROHO Group. Contact Roesler at (800) 851-3449, ext. 2803.